I have logged on to the game at least once a day almost every day since the game released, and certainly every day without fail since they introduced the daily calendars. However, for the past two monthly calendars, I have not had several days counted for some reason. I wrote last month off thinking I had just forgotten, but I know for certain I haven't missed any days this month, yet the last two days of the calendar are already marked off as missed. Anyone else have this issue? Can I get some help with this? Thanks. That has often happened to me where we have had one reward early one late one not received. Yep, absolutely happens with me too. At least once a week. Same with that energon card with the energon for 30 days I think. I'm already on day 22 and I thought that came out sometime around the beginning of July. I'm on about day 24 with the energon card, don't think anything is wrong with it. Pretty sure it's only going up 1 day at a time. Okay, so I'm having the team look into this, but I need to be sure... You guys are remembering that this runs from 00:00 UTC every day, right? You have to log in between 5pm PDT and 5pm PDT every day. It won't work if you log in at say... 6pm PDT, and then again at 1am PDT the next day. The day resets at 5pm. Just need to make sure before I escalate this much higher, because we have not been able to reproduce this issue in house yet. Be sure to close the game and re-log in ever 24h period. Sometimes I didn't get the calendar pop up until after I did that. because it's really disappointing too lose the best log in rewards. So it just gave me yesterday's rewards but it is still a day behind. I log in every morning when I wake up, between 6 am and 11 am Central depending on the day, then usually 5-10 times more during the rest of the day. I actually have been watching it over the past few days, just now I logged in and lost another day at the end of the calendar. You need to close the game and start it again if you want it to consider it a new day, otherwise the calendar don't work. That's not true, at least on my LG Stylo 2 and my son's Iphone 5. But the randomness is still there. My son plays every day like me, but on the calendar, he's like 1-2 days behind me. 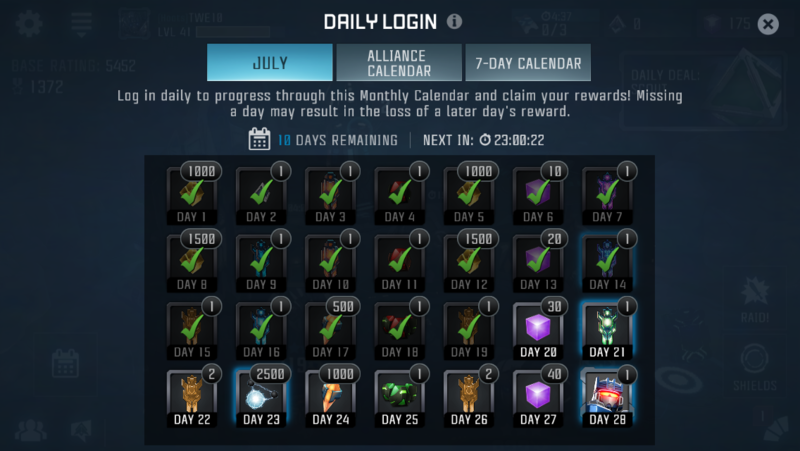 And I've mentioned before about not getting the items on a couple of days in July, even though it counts me as logged in. Also, not sure how to get in touch with someone about this, other than here on the forums, everything else I've tried just directs me to some article or whatever to read. Yep. You need to actually close and open the app every 24hr cycle. It's not enough to just play every day, you have to re-load the app every day. Also remember it's not just once per 24hrs, but once every day at Kabam HQ, meaning if it's 11:55pm PDT and you log in for the first time that day, you get the calendar item, then if you quit the game and re-open it 10mins later, you'll get the next day's item. But if you're in a different time zone, the calendar still goes off Kabam's time zone (PDT). 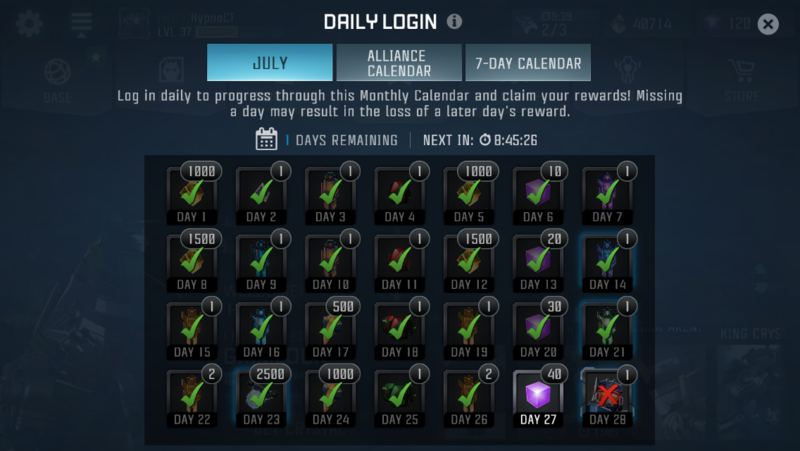 So for me (GMT+10), if I log in at 11pm my time, then again at 1am my time, both those log ins are during the same day at Kabam HQ, so I only get one tick on the calendar. Whereas if I log in at 11am, then again mid afternoon, I could get two ticks, since it's a new day in LA. login several times a day to be safe. I'm on day 24 now. Sometimes need to restart the game client to get the calendar popup. 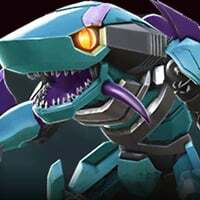 I log in a couple times a day yet this morning soundwave has been crossed off. Not Happy Jan!